South Africa has 12 million learners, 366 000 teachers and around 28 000 schools - including 390 special needs schools and 1 000 registered private schools. Of all the schools, 6 000 are High schools (grade 8 to grade 12) and the rest are Primary schools (grade 1 to grade 7). School life spans 13 years - or grades - although the first year of education, grade 0 or "reception year", and the last three years, grade 10, 11 and grade 12 or "matric" are not compulsory. Many Primary schools offer grade 0, although this pre-school year may also be completed at Nursery school. Recently, great advances have been made in the introduction of new technology to the formerly disadvantaged schools. 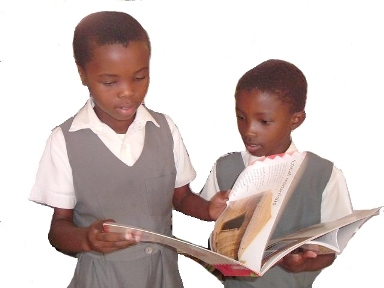 Organisations such as Khanya, (Xhosa for enlightenment) have worked to provide computer access in state schools. Many schools have created ICT (Information and Communications Technology) links with colleges across the world. The Specialist Schools and Academies Trust has been very active in supporting mutually beneficial partnerships. A recent national initiative has been the creation of "FOCUS" schools. These specialise in specific curriculum areas (Business & Commerce, Engineering, Arts & Culture) and are very similar to the UK specialist schools programme. For university entrance, a "Matriculation Endorsement" is required, although some universities do set their own additional academic requirements. South Africa has a vibrant higher education sector, with more than a million students enrolled in the country’s universities and universities of technology. All the universities are autonomous, reporting to their own councils rather than government. 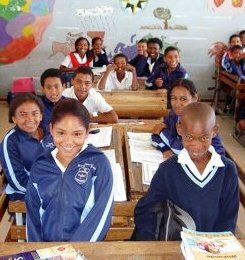 As of the 2001 Census 22.9% of the population in KwaZulu-Natal aged 20 years or more had received no education, while only 4.8% had higher education. The new University of KwaZulu-Natal unites two major educational institutions in KwaZulu-Natal – the University of Natal and the University of Durban-Westville. The University of KwaZulu-Natal aims to be a truly South African university, that reflects the society in which it is situated – not only in terms of race, gender and class – but in terms of how it structures its values and priorities and how it responds to social needs. As an institution of higher learning, it is committed to academic excellence, innovation in research and critical engagement with society. With its vision to be the Premier University of African Scholarship, the University of KwaZulu-Natal draws inspiration from an African identity and takes seriously its responsibilities to the development of the African continent. UNISA is Africa’s premier distance learning institution. They are a reputable, comprehensive, flexible and accessible Open Distance Learning institution. They offer internationally accredited qualifications and have world-class resources that inspire learners to create meaningful futures on their own terms. Their vision “Towards the African University in the service of humanity” drives them to find answers to Africa’s education and developmental problems. By forming partnerships in Africa and throughout the world, they are able to help the people of Africa achieve their dreams. UNISA's Campus: Pretoria (Gauteng), Provincial Centres: Florida (Gauteng), Durban and Pietermaritzburg (KwaZulu-Natal), Cape Town (Western Cape), Polokwane (Limpopo), Nelspruit (Mpumalanga), Mafikeng (North West), Kimberley (Northern Cape), Port Elizabeth (Eastern Cape), Bloemfontein (Free State). 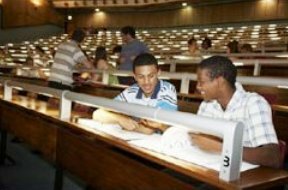 The Durban University of Technology is a technical university in KwaZulu-Natal, South Africa. It was formed in 2002 by the merger of Technikon Natal and ML Sultan Technikon and was previously known as the Durban Institute of Technology. It has four campuses in Durban, and two in Pietermaritzburg. In 2005, around 20 000 students were enrolled. This is situated on the outskirts of Durban and overlooks the beautiful Indian Ocean. Technikon education is tertiary education that provides students with career orientated skills, through a combination of theoretical knowledge and practical experience in the work place. Mangosuthu Technikon co-operates closely with commerce and industry, to ensure that the curriculum of a particular qualification is completely relevant to the chosen field and that the qualification is market related. Theoretical studies as well as a period of in-service training form part of the programme. Graduates enter the workplace equipped with the essential knowledge, range of abilities and practical experience relevant to their chosen careers. The earliest European schools in South Africa were established in the Cape Colony in the late seventeenth century by Dutch Reformed Church elders committed to biblical instruction, which was necessary for church confirmation. In rural areas, itinerant teachers (meesters ) taught basic literacy and math skills. British mission schools proliferated after 1799, when the first members of the London Missionary Society arrived in the Cape Colony. Higher education was generally reserved for those who could travel to Europe, but in 1829 the government established the multiracial South African College, which later became the University of Cape Town. Religious seminaries accepted a few African applicants as early as 1841. In 1852 British officials in the Transvaal and the Orange Free State acknowledged the right of Afrikaners to establish their own institutions of higher learning, and based on this understanding, Britain's incoming governor -Sir George Grey- allocated small sums of money to help fund Afrikaner institutions. The government established Grey College--later the University of the Orange Free State- in Bloemfontein in 1855 and placed it under the supervision of the Dutch Reformed Church. The Grey Institute was established in Port Elizabeth in 1856; Graaff-Reinet College was founded in 1860. The Christian College was founded at Potchefstroom in 1869 and was later incorporated into the University of South Africa and renamed the Potchefstroom University for Christian Higher Education. The schools suffered further damage as a result of the unrest of 1976. Vandals and arsonists damaged or destroyed many schools and school property. Students, who tried to attend school, and their teachers were sometimes attacked, and administrators found it increasingly difficult to maintain normal school activities. Some teachers and administrators joined in the protests. As the government implemented the 1984 legislation, new violence flared up in response to the limited constitutional reforms that continued to exclude blacks. Finally, the government began to signal its awareness that apartheid could not endure. By 1986 President P.W. Botha (1984-89) had stated that the concept of apartheid was "outdated," and behind-the-scenes negotiations had begun between government officials and imprisoned ANC leader Nelson Mandela. The gap between government spending on education for different racial groups slowly began to narrow, and penalties for defying apartheid rules in education began to ease. The apartheid regime created different universities for different race groups, often in close proximity and offering the same courses, but neglected the development of historically black institutions. In a country with scarce resources, with institutions of uneven capacity, there was an urgent need to cut down on costly duplication and improve quality across the sector. After several years of investigation and consultation, the government announced plans to radically restructure higher education through mergers and incorporations that was completed by January 2005 and created 22 institutions out of an existing 36 universities and technikons. Out of the 36 institutions 22 were selected for mergers, four for major incorporations (or loss of facilities), one was being dismantled and its multi-sites slotted into other institutions, and there are 10 new university names. In South Africa, education plays a huge role compared to other countries. The government usually spends 20% of their expenditure on education. Black Africans were perceived to have the role of labourers and servants. During the 1980s the young population was committed to destroying the education system, due to the apartheid. There were strikes and violence which firmly restricted its ability to function in an orderly manner. Even though the government spends 20% annually on education the apartheid theory still sticks around. Among the South African population, only 14% of blacks have an education of high school or higher, whereas 40% of Indians and 65% of Whites have an education of high school or higher. Technology has become an increasingly important component, especially in the Western Cape and Gauteng. Khanya has led the way in bringing the formerly disadvantaged schools into the global classroom, sometimes with the support of the UK based, Specialist Schools and Academies Trust. 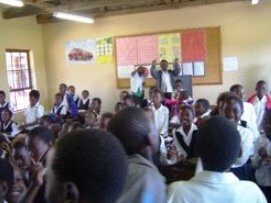 In South Africa, you can find the concept of public and private school which vary according to character, size, quality of education, and financial advantages. With both public and private intuitions, the education in South Africa is very promising. Most of the schools are supported by the state, but private schooling is also widely common. 2.8% of the total school population is private equalling 340,000 students. Today the literacy rate is 86%.